How do I join Cultivate Michigan? Cultivate Michigan accounts are currently available for institutional food purchasers. You can join by clicking any of the "Join Now" buttons on the website -- on the main page, in the left-hand sidebar, or at the bottom of the page. Enter your information on the registration page to create your account. Within 48 hours you will receive an email approving your account. Then, you can complete your profile. Once your profile is complete, you will be able to log in and see your Dashboard, where all surveys are made available to you to track your local food purchases. You can check out our guide, How to Join Cultivate Michigan (PDF) for more details about joining and what's involved in participating. A webinar recording is also available to help guide you through the sign-up process. Watch the How to Join Cultivate Michigan webinar now. What does participating in Cultivate Michigan involve? If you sign up for Cultivate Michigan, we'll ask you to to complete a profile on the Cultivate Michigan site and to track your local food purchasing through our quarterly surveys. Entering this information helps you keep track of your local purchasing over time, and helps us to measure statewide progress toward the goal of getting 20% Michigan food in institutions by 2020. Check out our Guide to Signing Up for more information. Each year, Cultivate Michigan will feature four foods available seasonally. By highlighting these foods, we hope to increase demand for them and, in the long run, institutions' access to them. Access to a Dashboard on the Cultivate Michigan site, where you can track purchases and see progress over time. Purchasing guides to help make it easier for you to find, buy and use each featured food. From these guides, institutions can learn how to source Michigan products from distributors or directly from farmers, and find recipes that have been tested and perfected by food service members. Marketing materials you can use to promote Cultivate Michigan's featured foods and share the results of your efforts with staff members, eaters and communities. How do I become a member of the Michigan Farm to Institution Network? How does this differ from joining Cultivate Michigan? Which should I join? Cultivate Michigan is a local purchasing campaign launched by the Michigan Farm to Institution Network. Institutions purchasing food can join by creating an account to track their purchases. Visit the Michigan Farm to Institution Network online for more information about Network membership. Members of the Michigan Farm to Institution Network support the activities of Cultivate Michigan, ranging from hosting tours and events to supporting the latest research. What if my institution is part of a larger network of facilities (e.g., school to school district or hospital to health system)? If your facility is part of a larger network of institutions, there is an option for enrolling multiple institutions with one user account or creating one account for the broader health system or school district, etc. Start by creating your user account and identify your institutional name as broadly as possible (e.g., Healthy System A). Once approved, you can choose to fill out a single profile with information from the broadest institution, and then track only the combined purchasing, or create separate profiles for each facility and track each one separately. Option 1: Single profile - After logging in, complete the Profile using the institutional name you signed up with, and the combined information for all facilities. Then when you complete the Quarterly Surveys about local purchasing, use the purchase totals from all the facilities combined. Option 2: Separate profiles - Log in and start by completing a Profile for one specific facility, using that facility name and relevant information. Once you submit this Profile and are taken to the Dashboard, click the link to "Add Another Institution" and complete a new Profile for each remaining facility. When you complete the Quarterly Surveys about local purchasing, enter each facility's purchase numbers into a separate survey specifically for that facility. If you have questions or want to verify if other institutions you're connected with have already signed up, send an email to info@cultivatemichigan.org. Why can’t I see my dashboard after logging in? In order to see your dashboard, you must have submitted your profile. Otherwise, the system will prompt you to finish it by taking you directly to the profile survey after you log in. You will have completed the survey once you hit the Submit button on the last page of the survey. What information about my institution’s food purchases will I need to provide? We rely on the quarterly surveys to be able to measure your progress toward the 20% by 2020 goal, and to measure our progress statewide. Once you are done, hit Submit and you will be able to see the completed survey on your Dashboard. Once an institution completes their profile, they can choose to have the name of their institution listed on the Cultivate Michigan website under "Who Has Pledged?". They will be given a personal dashboard (visible only to that institution and campaign personnel). 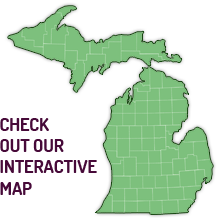 Over time, you'll be able to use this dashboard to track how much your institution is spending on Michigan foods. Combined information on how much all participating institutions are spending on local foods will be shown on the Cultivate Michigan website. No information about individual institutional spending will be shown publicly. Lastly, campaign personnel may use the information to follow up with the institution to support their efforts to buy Michigan foods.